03 Jul 2018 / 14:19 H.
KUALA LUMPUR: The final cost of the East Coast Rail Link (ECRL) project is actually RM81 billion and must be reduced significantly to make it viable financially. The Finance Ministry said that the RM81 billion does not cover its operating cost and Selangor government is also against the completion of the Gombak-Port Klang portion of the rail line. "The ECRL project is also not expected to cover its operating costs. Indeed the RM81 billion project cost does not include operating deficit, which cannot be determined for now. 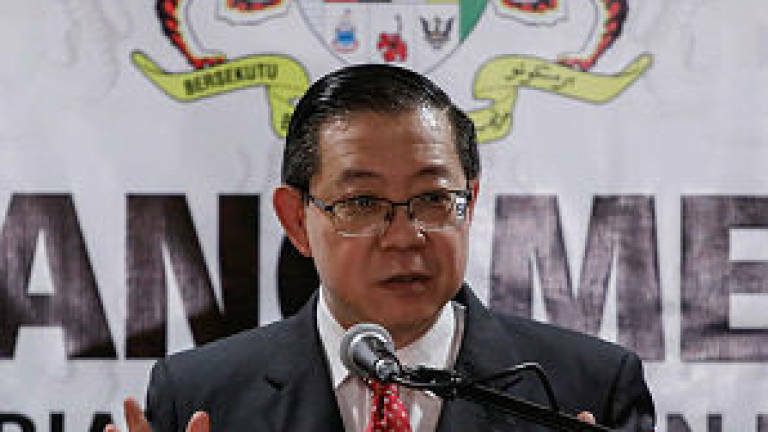 Furthermore, the Selangor state government objects strongly to the completion of Gombak-Port Klang portion of the rail line," Finance Minister Lim Guan Eng said in a statement today. Selangor's objection is principally based on the state's application to establish the 16km-long Klang Gates Quartz Ridge, which is the longest of its kind in the world, as a Unesco World Heritage Site. "Completing the Gombak-Port Klang link would guarantee the failure of Selangor's application. Only after a significant price reduction on the ECRL is obtained, will the Federal Government enter into discussions with the Selangor state government on the merits of the ECRL project as compared to the possible Unesco World Heritage Site listing," he added. The ECRL project was first approved by the previous Cabinet on Oct 21, 2016, while the Engineering, Procurement, Construction and Commissioning Agreement was signed with China Communication Construction Company (CCCC) on Nov 1, 2016. The original project scope was to build a rail line from the Integrated Transport Terminal (ITT) Gombak in Selangor to Wakaf Baru in Kelantan at a cost of RM46 billion. On May 13, 2017, the previous administration signed an additional agreement with CCCC to carry out Phase 2 of the project, which was to extend the line from ITT Gombak to Port Klang for RM9 billion. Earlier on May 3, 2017, the Cabinet approved the northern extension of the project from Wakaf Baru to Pengkalan Kubor in Kelantan, for the value of RM1.28 billion. Subsequently, on Aug 23, 2017, the Cabinet further approved the upgrading of the ECRL to a double-tracking project which would cost an additional RM10.5 billion. Based on these figures, the basic cost of construction of the 688.3km rail line amounts to RM66.78 billion. However, the total cost of ECRL will be RM80.92 billion after taking into account land acquisition, interest, fees and other operational costs. "The Government via its wholly-owned operating subsidiary, Malaysia Rail Link Sdn Bhd (MRL), has paid CCCC the sum of RM19.68 billion, comprising of (i) advance payment of RM10.02 billion and (ii) progress payment of RM9.67 billion. The advance payment of RM10.02 billion, however, is backed by an advance payment bond of the equivalent amount," he explained. This advance payment bond may be redeemed by MRL to recover up to RM10.02 billion. "In other words, in the event of a worst-case scenario, the Federal Government can recover RM10.02 billion of the RM19.68 billion paid." Lim reiterated that based on the above facts and figures, as well as the feasibility studies of the project, we expect that the ECRL project will only become financially and economically feasible if there is a drastic price reduction of the project by the CCCC. "Discussions on cost will be held with the contracting parties and others involved in the project. We also take cognisance of the strong objection by the Selangor state government towards the ECRL project, especially with respect to the rail link from ITT Gombak to Port Klang. Section 20A of the Town and Country Planning Act 1976 states that Federal Government needs to consult the state government before carrying out any federal project in the relevant state."